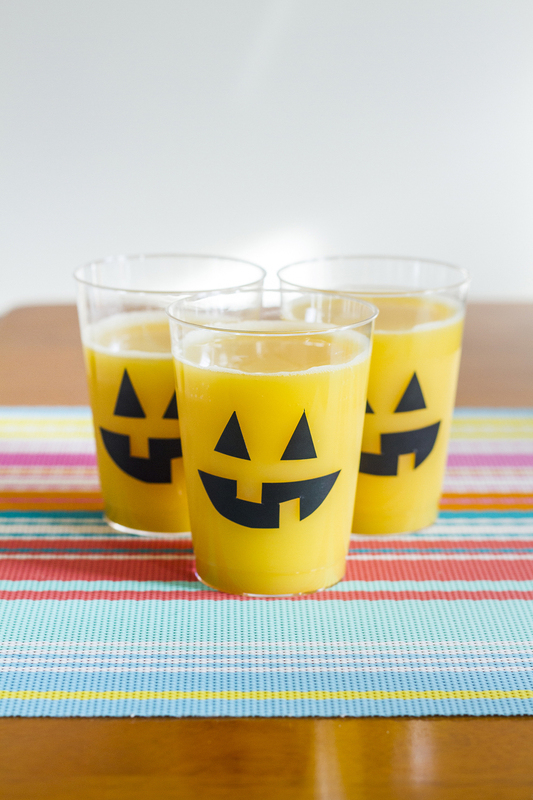 Are you ready for the simplest Halloween project of all time? This one takes about 15 minutes to put together and requires the use of just three supplies that you might even already have on hand! A holiday craft project that’s free and takes hardly any time to make? That’s my kind of project. Read on for the super simple steps—adapted from this genius Sugar + Cloth project—plus my easy pumpkin punch recipe, too. And in case you missed the companion post to this feature (my DIY black cat placemats and dotty cupcake toppers) click through here. 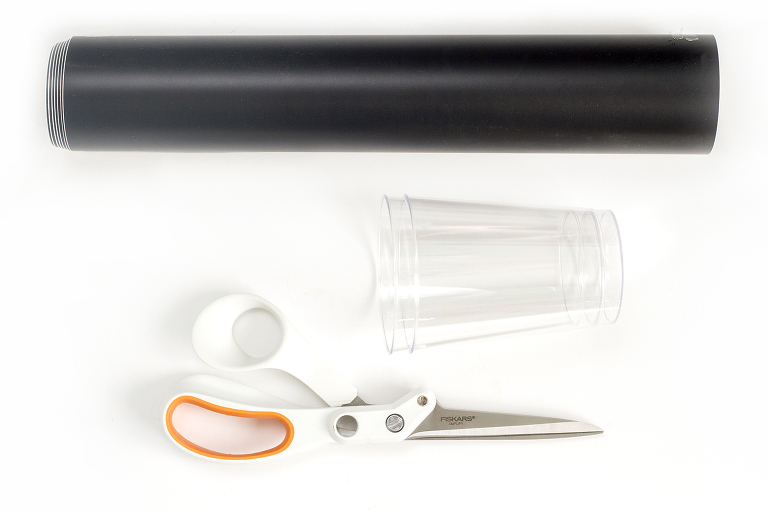 To make, simply unroll a small length of black vinyl and lay it on a flat work surface. Then, take your scissors and cut angled notches into the edge of the vinyl to create triangle cut-outs. These will be the “eyes” of your pumpkin faces, so you’ll need two for each cup—I cut out eight triangles for my four cups. Set them aside. 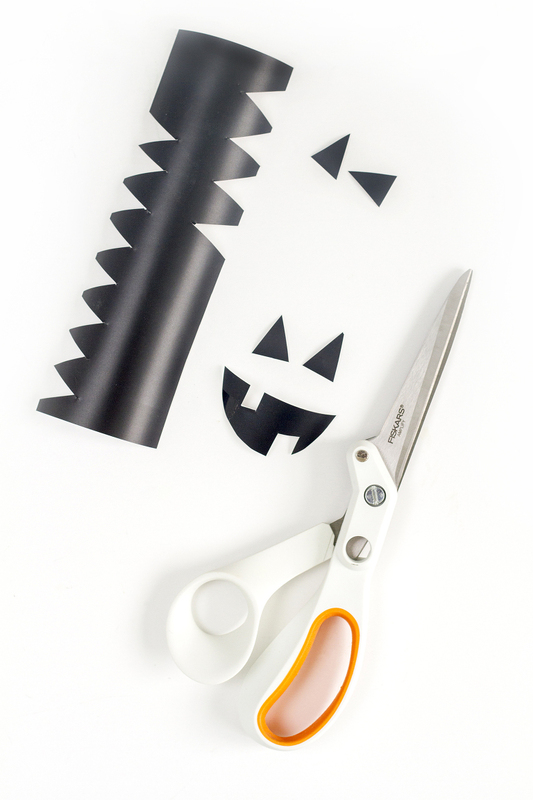 For the “mouths” of your pumpkins, cut out semi-circle shapes from the vinyl with your scissors. These will be your base shapes for that tell-tale pumpkin-y smile. Cut “teeth” into the mouth shapes by snipping squares out of the vinyl—one from the top and one from the bottom, next to one another with a small gap in between. Peel the paper backing off of the black vinyl mouths and eyes, and then carefully stick them to the sides of the cups in a general pumpkin face shape. If you want the glasses to have different expressions, feel free to cut different shapes from the vinyl and add them to the cups instead! Again, hop through to Sugar + Cloth for a few other alternative designs to try. My DIY carved pumpkin face glasses were the perfect finishing touch at our at-home Halloween soirée, especially when filled with my tasty pumpkin punch. The orange juice base really brought the pumpkin point home when poured behind that cheeky black vinyl face, don’t you think? As for the recipe, simply fill 1/2 of the cup with orange juice, and then add a splash of pineapple juice and 7UP. To make it a little more adult-friendly, swap out the pineapple juice for pineapple vodka. Cheers! Again, to make your own version of my DIY black cat placemats, click here.